Fences mark the boundary of your property and have an important role in both the aesthetic appeal of your home and its security. A well-designed fence can provide an appealing exterior to your property and complement the design features of your home; your fence should reflect your personal style with excellent quality, strength and durability. There are many factors to take into account when considering the design of your fence and these include its purpose, your design style and the harsh climate of the Gold Coast. Fences serve as the first line of security for your home and are constantly exposed to the elements, which means that they must be highly durable and very strong. This does not need to come at the expense of design, however, and here at Dean Wilson Iron we craft customised and intricately designed fences that incorporate strength and aesthetic appeal for a solution that is unrivalled in functionality and design. 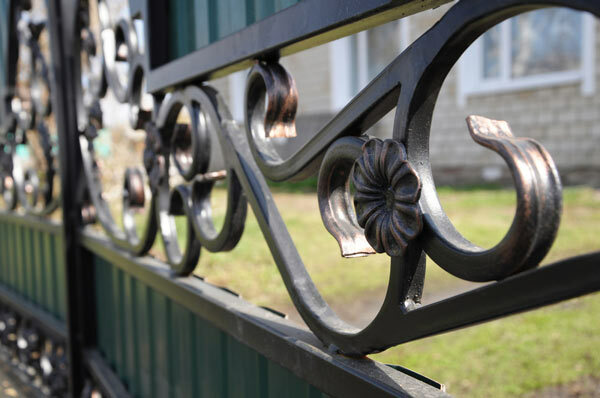 Throughout our many years of experience, we have found wrought iron to be the ideal material from which to craft our custom fences, as its many properties offer a range of advantages. Wrought iron is extremely strong and this means you can rest assured that your property is secure. With this strength comes durability and our wrought iron fences can last you for decades – even in the harsh coastal climate of the Gold Coast. As well as this, wrought iron is very malleable and this allows our skilled blacksmiths to bring your design concepts to life – no matter how intricate or unique they may be. Wrought iron offers a timeless elegance and a customised wrought iron fence is a personal statement; it can be crafted to complement the design features of your home, whether they are modern contemporary homes, classically designed houses, old Queenslanders or anything in between. We pride ourselves on client engagement and we work with you throughout the entire process to deliver a perfectly tailored fencing solution that fulfils every one of your needs. At Dean Wilson Iron, we recognise that every one of our customers has specific and individual needs. To meet these needs, we strive to engage with our clients throughout each stage of the process to determine exactly what you would like from your fence. 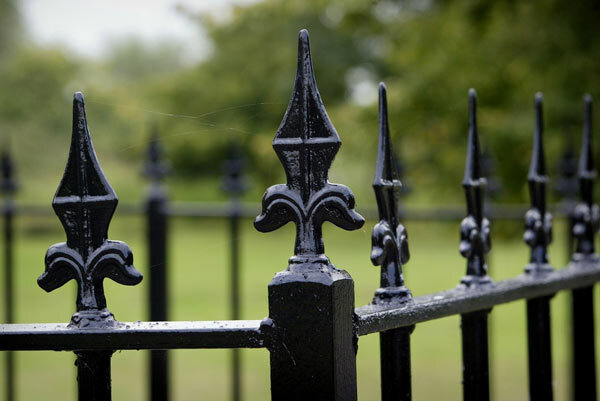 Mass produced, poor quality substitutes simply do not offer the prestige and quality of a handcrafted wrought iron fence and our priority is to deliver a fencing solution that is perfectly tailored to your specifications and the nature of your property. Our team of blacksmiths have a wealth of knowledge and experience when it comes to working with wrought iron and we are well equipped to create a fence that will give your home a designer edge unlike any other. We can undertake fencing solutions of all varieties – no job is too big or too small and we can cater for the needs of all our clients. Over our many years in the industry, we have tailored our services to ensure that they remain the most comprehensive on the Gold Coast. As a part of this, we offer fences that can be incorporated into block walls and brickwork or we can create freestanding fences with their own posts; it all depends entirely upon your specifications. We can build fences of all size and designs – there is no job too big or too small and we pride ourselves on catering for all of our clients. We recognise that everyone’s needs are different and our blacksmiths can help you develop a design that suits you. Our team can create fences that feature intricate and elaborate wrought iron designs, sleek and elegant contemporary designs and everything in between. Distinguished and appealing designs to give your property a unique edge. Effective security to deter intruders at no expense to your home’s ambience. Great durability to withstand the Gold Coast’s harsh coastal climate. The excellent value for money that comes with a fence capable of lasting you a lifetime. Here at Dean Wilson Iron, our aim is to facilitate the construction of you own personalised wrought iron fence and we value your input above all else. Over our many years of operation in the industry, we have developed a service approach that is targeted at working with you to explore your options and create the most suitable fencing solution for you. Before we commence work on your customised fence, we like to discuss your requirements with you and get a clear picture of what you need from your fence. This initial discussion is very important, as it allows us to explore you options in detail and work with you to develop a design that meets your criteria. If you have any design concepts of your own that you would like to include in the fence, then we encourage you to discuss them with us – this enables us to make your ideal fencing creation a reality. At Dean Wilson Iron, we understand that a new fence can be a big commitment and we strive to make the process as smooth and simple as possible for you. To make sure that you have plenty of time to consider you options and assess your own needs, we can provide you with an instant initial quote. Our initial quotes are based on some basic measurements and some design information, which means that you will not have to spend days or even weeks waiting for your quote to be processed; you can get a clear picture of costs from the very start. The first two steps of our service process allow us to ascertain precisely what you need from your fencing solutions and this information enables us to refine our approach and ensure that your fence is crafted perfectly to your specifications. We value your involvement in the process and encourage you to present us with any input that you may have with regard to the creation of your fence. Our team will make sure that you are kept fully informed throughout the build and they can send you updates by way of progress photos – we even invite you to inspect your fence in person at various stages of completion. By keeping you fully involved, we can ensure that your fencing solution is completed to the highest possible standard. Once your fence has been finished to your satisfaction and our uncompromising standard of quality, it will be ready for installation. The team here at Dean Wilson Iron specialise not only in crafting wrought iron fences, but also in installing them. We offer a comprehensive range of installation options, which include fitting fences to brickwork or block walls and stand-alone fences with their own fence posts. If you are looking for a fencing solution that will appropriately complement the design features of your home, then contact us today at Dean Wilson Iron. Alternatively, if you are interested in some of our past work, we can be found on Facebook and are happy to address any of your queries. #1 Will my wrought iron fence rust? 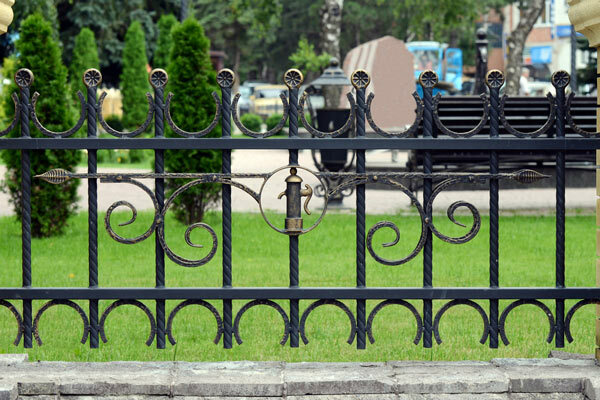 Wrought iron, like most metals, can rust if it is not finished correctly. Because of this, we take many precautions to ensure that all of our products are finished immaculately, using a process that will safeguard against rust for decades. We begin by sandblasting our metal, before applying a zinc coating, which protects against rust, and a decorative powder coat or hand-rubbed natural iron finish for aesthetic appeal and extra protection. This effectively prevents all of our fences from rusting. Here at Dean Wilson Iron, we strive to craft unique designs and your input is what allows us to do so. We like to discuss all of your design concepts in detail with you and explore your options. We work with you to ensure that your perfect fence design becomes a reality and we will guide you through the process so that the end product reflects your perfect design, with the upmost in quality and functionality. #3 Will my fence require maintenance? 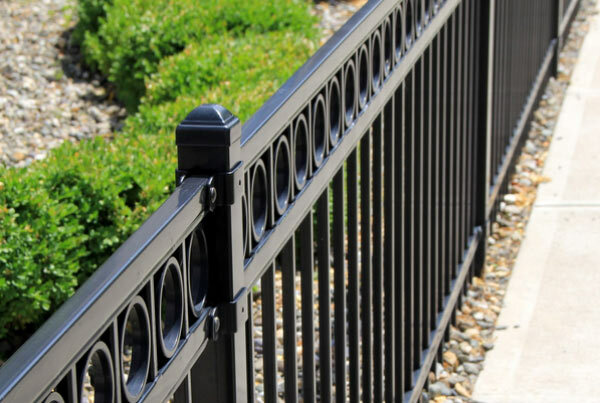 As with all fences your custom fence may require some maintenance, however wrought iron is extremely durable and is unlikely to require very frequent attention. When your fence appears to be dirty, we suggest gently washing it with soapy water and rinsing the soap off. This should not be necessary too often, however the frequency of washes will depend on the area in which your fence is installed. #4 How long will it take you to complete a custom fence? Here at Dean Wilson Iron, all of our products are carefully handcrafted by expert blacksmiths and this means that it is ideal to allow as much time as possible for the completion of your fence. The time taken to complete your fence will depend on its size and design, however we have found that many of our creations take between six and eight weeks from design to completion.